Totenkopf - THE MASSACRE AT LE PARADIS - HELL IN PARADISE - MAY, 1940. 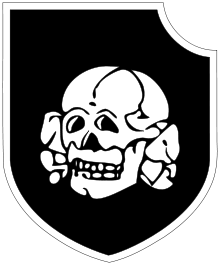 THE SS Division Totenkopf was formed in October 1939 and had close links with the Nazi concentration camps with many of its members being former guards from camps such as the notorious Dachau. Members of SS Militias were also transferred to the division. The Totenkopf was strongly indoctrinated with Nazi ideology under its commander Theodor Eicke (left). Members had a fanatical loyalty to both Eicke and to Germany and fought recklessly, suffering higher death rates than other German forces. The Battle of France was SS Division Totenkopf's first major engagement of the war and they were called to the front line on May 17th. Totenkopf was used to "mop up" Allied forces in the area of Cambrai and the division had taken 16,000 prisoners. By the time the operation had finished in Cambrai, the first German units had reached the English Channel, but the British counter-attacked just west of Arras on 21st May, following on from the counter-attack of the day before. The Totenkopf division suffered casualties of just under 100 men in repelling the assault. The Totenkopf was then ordered to the town of Bethune and crossed the La Bassee River under British attack on 24th May. However, the men were ordered to retreat the next day to preserve tanks for the upcoming campaign in Dunkirk and to allow the Luftwaffe to attack Allied positions in the area. The men had to make the hazardous crossing again on the night of 26th May. The SS men took Béthune after heavy hand to hand fighting with the British, who withdrew to a line between Locon and Le Paradis. ​ The 2nd Battalion of the Royal Norfolks, along with the 8th Lancashire Fusiliers were holding the Allied line at the villages of Riez du Vinage, Le Cornet Malo and Le Paradis with the battalion headquarters at Duriez Farm at Le Paradis. The battalions had been ordered to hold out for as long as possible against the Germans to give time for the British Expeditionary Force (BEF) to evacuate from Dunkirk. The SS Division Totenkopf emerged from the Bois de Paqueaut Wood and attacked Le Cornet Malo at dawn on 27th May. The British troops defended stubbornly but were eventually overrun. The attack resulted in the deaths of four German officers and 150 men. Another 480 men and 18 officers were wounded. Later the same day, the German troops moved forward to attack Le Paradis. This ultimately resulted in the massacre at Le Paradis. The skull on the left was the Totenkopf insignia. 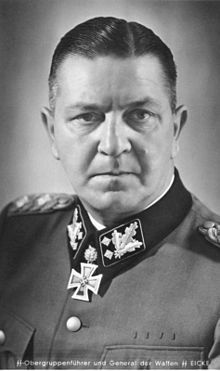 "Theodor Eicke... was ordered by Himmler in 1934 to dissolve existing smaller camps and re-organise them into larger remaining camps. These camps were under the jurisdiction of the Death Heads Units of the SS making Eiche one of the key figures of this known 'system of terror.'" The young and most able were formed into a specialised battle unit in 1940. The Totenkopf Division became part of the Waffen SS, taking the following oath. "I swear before God this holy oath, that I should give absolute pledge to the Fuhrer of the German Reich and people, Adolf Hitler, the Supreme Commander of the Wermacht, and as a courageous soldier will be ready at all times to lay down my life for this man."